Astilbe is a gorgeous perennial that is right at home in a shady moist garden. You can grow it alone, but a well designed garden looks better with more than just one type of plant. These astilbe companion plants like the same moisture and light conditions and will make a beautifully coordinated garden bed. Selecting companion plants for astilbe means considering cold hardiness, soil type and sunlight requirements. Not only does astilbe love the shade, it also likes an acidic soil. Think of the floor of a woodland forest. The soil is well draining and rich in organic matter. This is what astilbe likes. Since the perennial can also take the cold well, her companions must do the same. So, what else can grow in these types of conditions? These 15 Astilbe Companion Plants are your answer! Astilbe is hardy in zones 3 through 9. My mother had hers in a garden in Maine and I took some divisions and have mine growing in North Carolina. 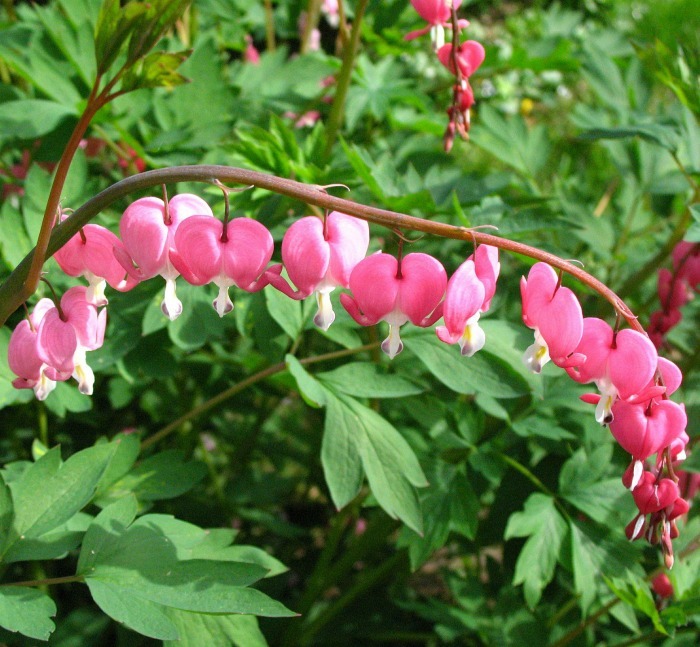 The perennial LOVES the shade and will be the star of any shady garden bed. Have you wondered what you can grow along side of astilbe? I’ve put together a list of plants that love the same spots that astilbe does. 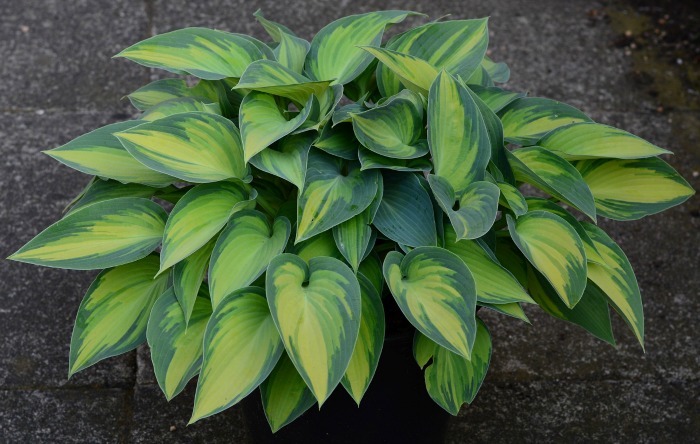 Hostas are shade loving perennials that are grown mainly for their colorful leaves. The sizes of hostas can vary from fairly small plants to mammoths that can grow up to four feet tall and take over a whole garden bed. All hostas will flower, generally on a long stem with a small lily like flower that sits atop the plant. Most hostas love the shade but this is not always the case. Some can take a bit more sun. When choosing which hostas to plant with astilbes, think color. The lighter the foliage, the more sun the hosta can take. A deep and dark hosta will retain color best in moderate shade. For a couple of variegated varieties, see my growing tips for Hosta Minuteman and Autumn Frost Hosta. 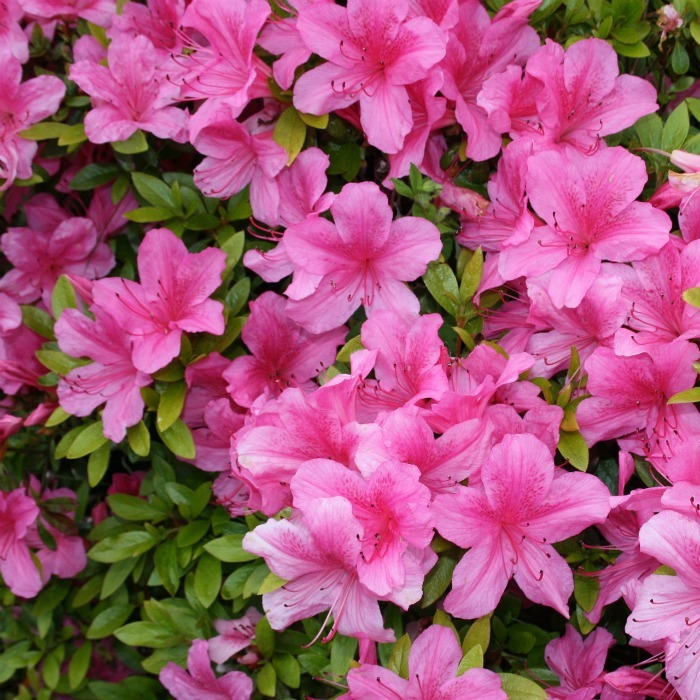 Azaleas come in a huge array of colors. Even though their bloom time is short – they are an early spring bloomer – they add color like just about no other perennial shrub can do. Azaleas also prefer an acidic soil, so planting them near astilbe under the shade of a pine tree is beneficial. Prune azaleas when the bloom time is over for good growth next season. 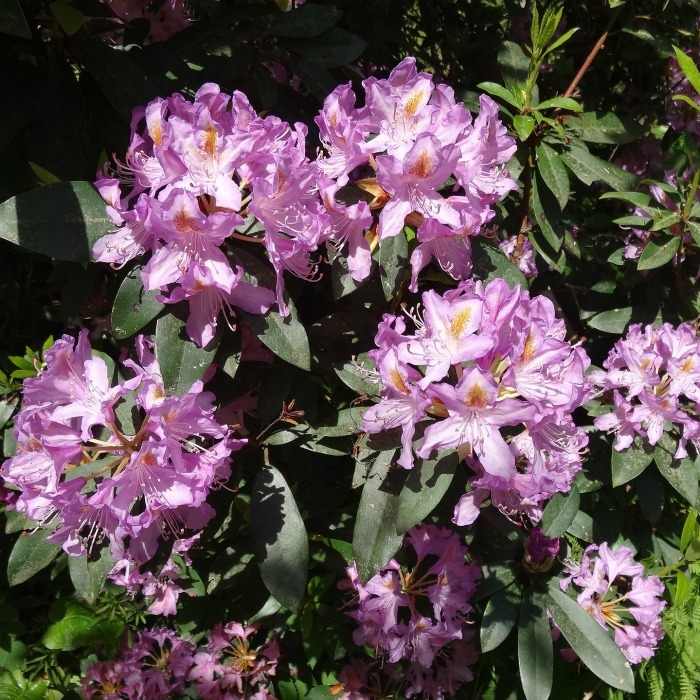 My husband and daughter call my rhododendron the “ice cream plant” because of the clusters of blooms that look like a big scoop of ice cream. This shade loving perennial shrub is easy to grow once you get it started. Just give it moisture, shade and mulch to inhibit root fungus. Although not a perennial, impatiens is an annual with prolific flowers all season long. I have grown single, double and New Guinea impatiens successfully along side of astilbe. 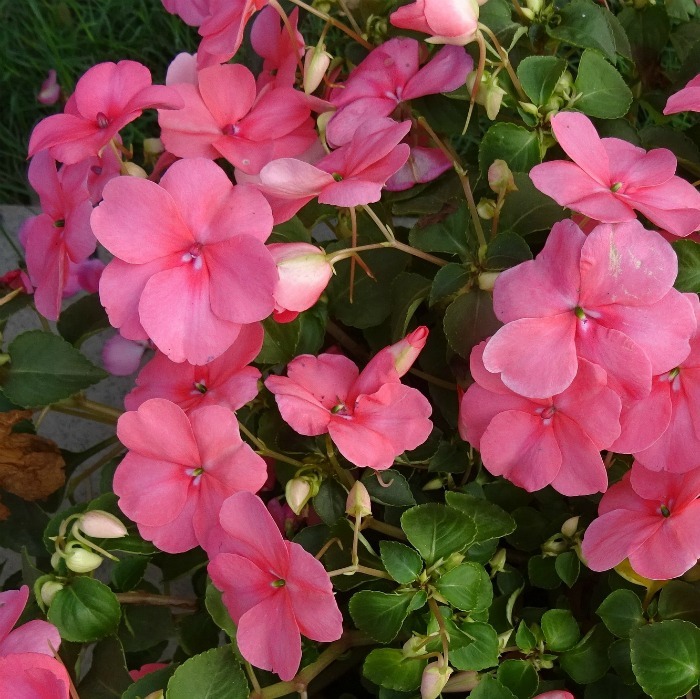 One of the best characteristics of impatiens is that there is no need to dead head since the flowers drop off themselves when the bloom time is done and new ones will develop. Great for busy gardeners! What is better than one astilbe? Lots of them! Astilbe comes in a wide array of colors and sizes. Group them together for interest. 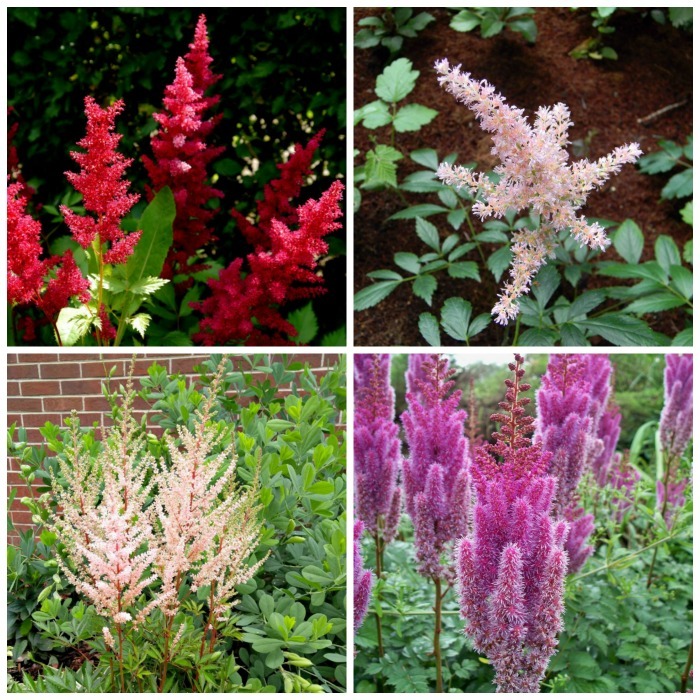 See my article on the colors of astilbe for some ideas. This pretty early spring bloomer is a tender perennial in most zones, but it comes back just fine for me here in NC. It does best planted in dappled shade and loves to be mulched to keep the moisture in the soil and help to keep the leaves thick. If planted in direct sun, it will scorch easily, so it is very happy as an early blooming companion to astilbe in a shady spot. 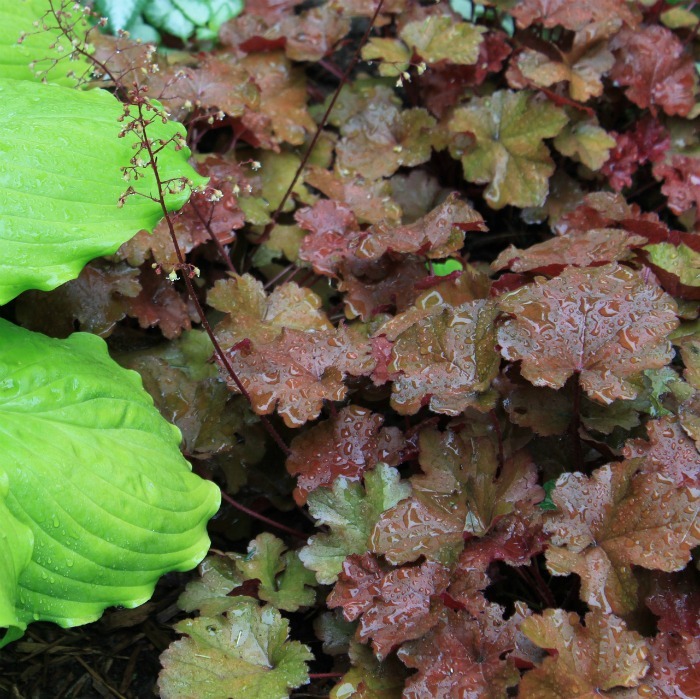 Heuchera, or coral bells, is a great astilbe companion plant. Coral bells are a relative of the astilbe and likes pretty much the same growing conditions, so it is an ideal partner. The plants grow in a similar way with flowers that emerge on long stalks that sit above the plant. There is more color and pattern to the leaves of coral bells than astilbe, which is grown more for its flowers. Finally, I got wise and realized that shade loving really does mean shade loving, and planted it in my north facing bed near my astilbe. It gets NO direct sunlight and when I mulched the bed yesterday, there is was with a row of hearts all saying “thank you, Carol!” With this much heartache, bleeding heart tops my list of astilbe companion plants. One annual that I plant every year in all of my shady garden beds is caladium. I have some in pots and others right in the ground. If I can remember to dig them up before the frost hits in the fall, I save the tubers, but let me tell you from experience, once the frost hits there won’t be a hint of where they were growing. 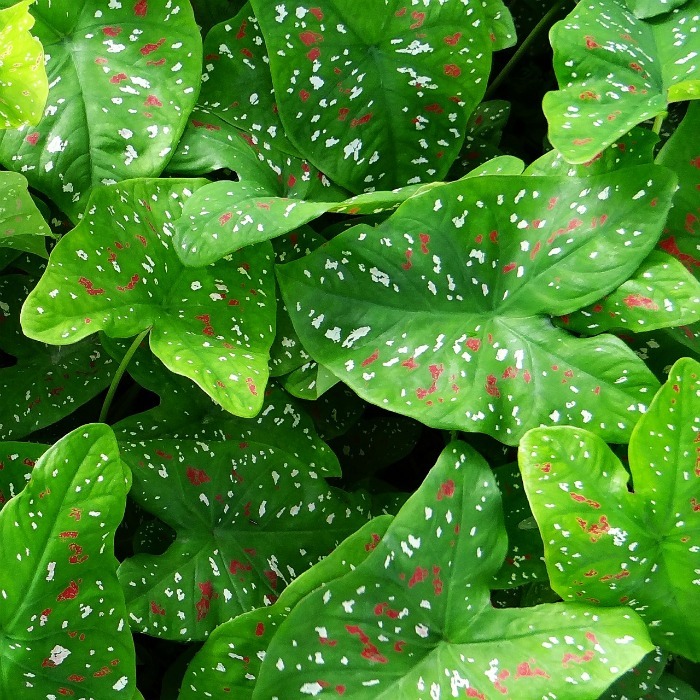 Caladiums are grown for their magnificent heart shaped leaves in colors from white to deep red. They are an ideal astilbe companion plant. 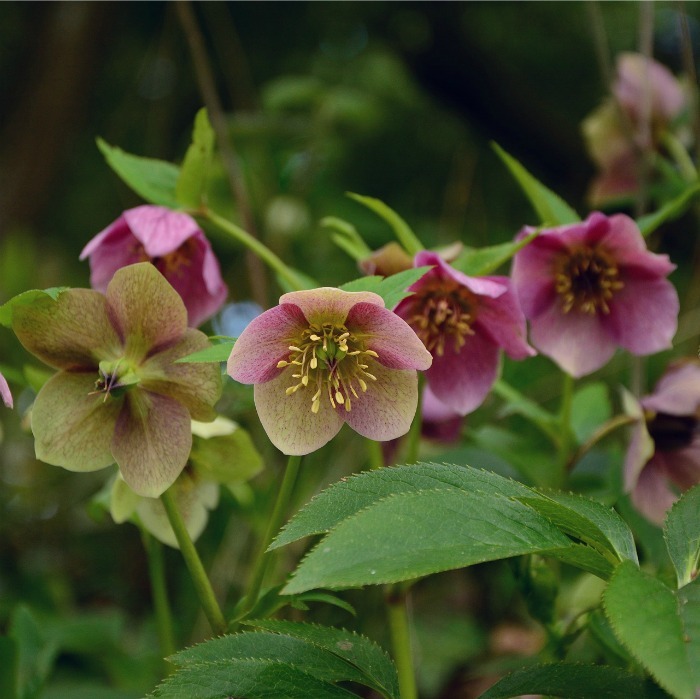 The star of a winter shade garden is Hellebore or Lenten Rose. Mine started flowering in the middle of January with snow all around and is still flowering, months later. Talk about a long flowering time! Not only do the flowers last well in the garden, but they make great cut flowers and will last for WEEKS indoors. It is one of my favorite astilbe companion plants. Astilbe will start flowering when hellebore is done. Sun Loving plants that do fine as Astilbe Companion plants in hotter climates. Hydrangeas are not typically considered a shade plant but here in North Carolina, I do best with it by keeping it out of the direct sun. I have both astilbe and hydrangea plants growing in my North facing front garden bed and both bloom well here. In fact, the ones that I had in direct sunlight only did well until the hottest months. I eventually moved them all to a shadier spot and they are much happier. 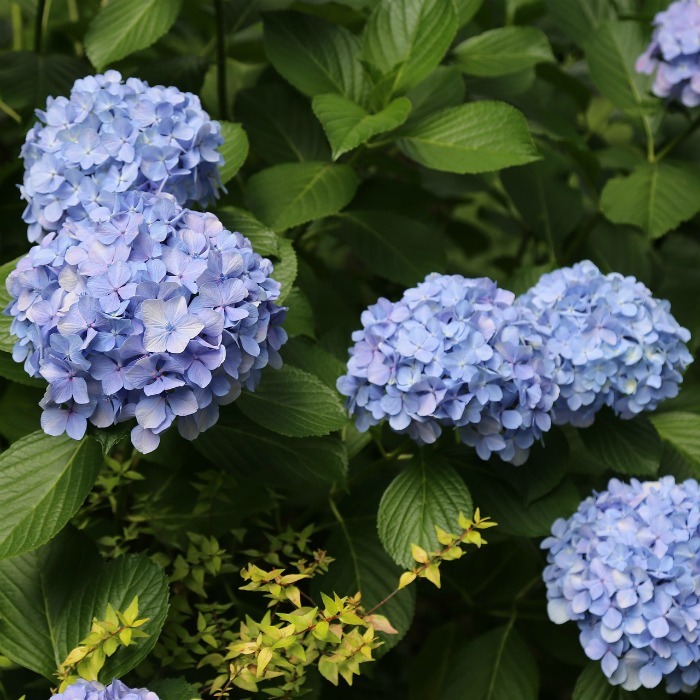 So, if your climate is hot consider growing hydrangeas as one of your astilbe companion plants. 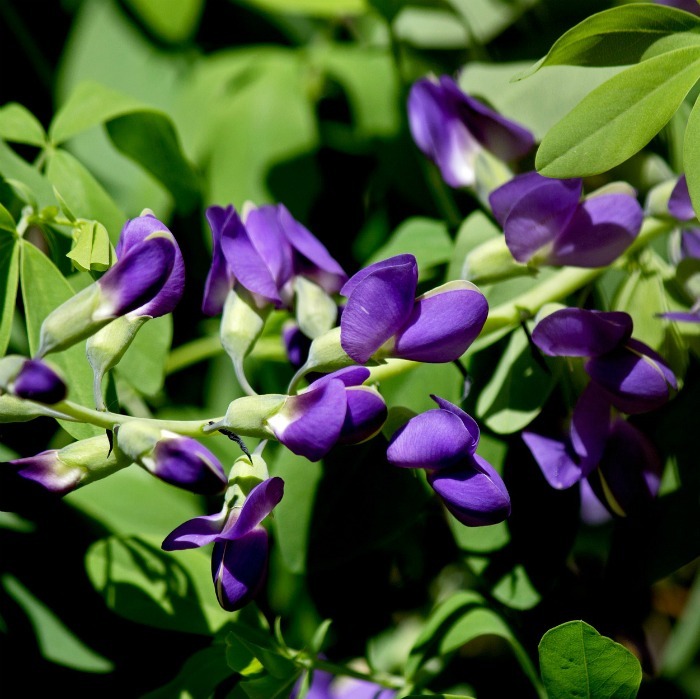 Although it is happy in more sun, Baptisia Australis will tolerate some shade too. I have it growing on the edge of my front shade border that gets direct sun in the later afternoon. It is perfectly happy there and flowers beautifully just like the ones in my sunnier garden beds. 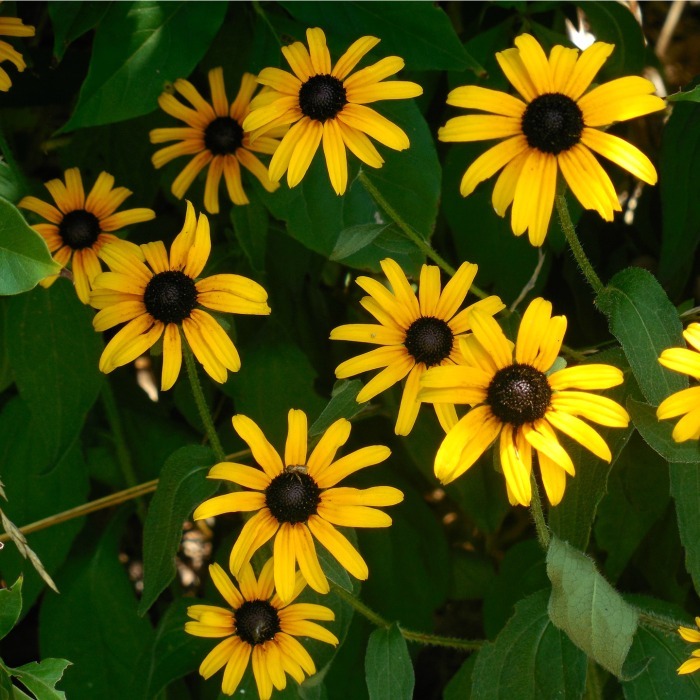 Another plant that generally likes plenty of sun but does just fine in a shady bed is black eyed Susan. I have some growing in full afternoon sun, part afternoon sun and mostly shade. The thing that I like best about it in the shade is that the size is more manageable. In full sun it takes off but grows into a pretty large shrub and can take over a garden bed. It flowers just fine in my shade garden and is much easier to keep the size that I want. 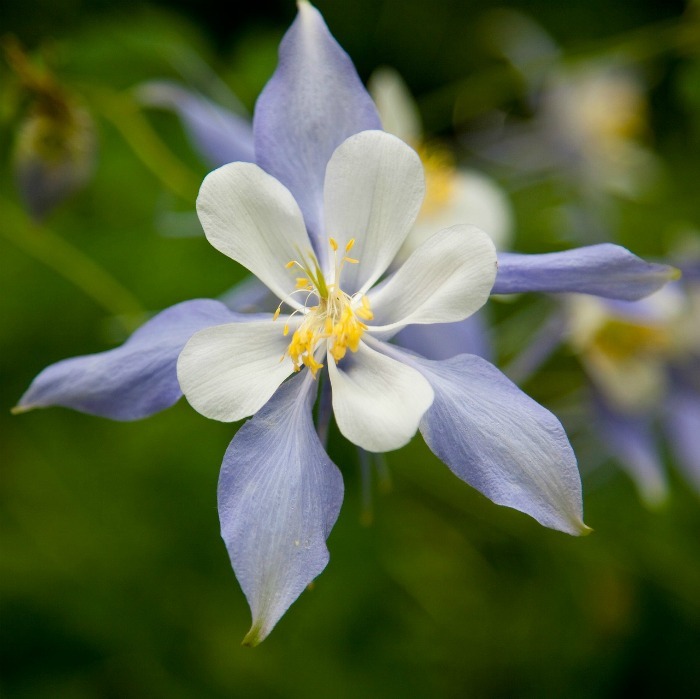 Normally a plant that likes plenty of sun, here in the southern party of the United States, columbine prefers a more shady spot. 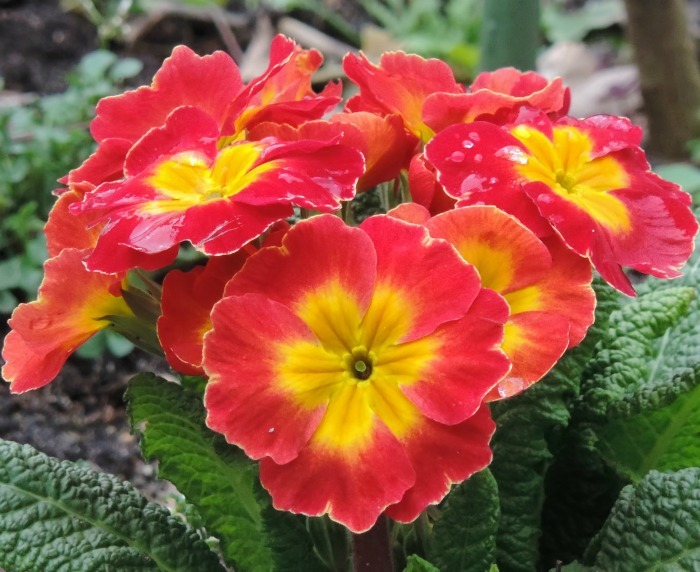 It is a prolific self seeder and before you know it, you’ll have a bed full of smaller plants. Notes of growing the plants above. I have 5 shady garden beds around my home. The list of astilbe companion plants above are planted here and there in all of the beds. The shade conditions vary from north facing beds right in front of my house in almost full shade, to a large bed under a pine tree that gets some early morning and late afternoon sunlight. Both astilbe and its companions love all of the beds and look beautiful. Best of all, the plants flower at different times and this gives me all season long color for a wonderful effect. What is your favorite plant to add to a garden bed with astilbe? ← Natural Squirrel Repellent Ideas – Keep the Critters out of Your Yard! It’s nice to find someone else who dabbles in a little of this and that in and out of the house. 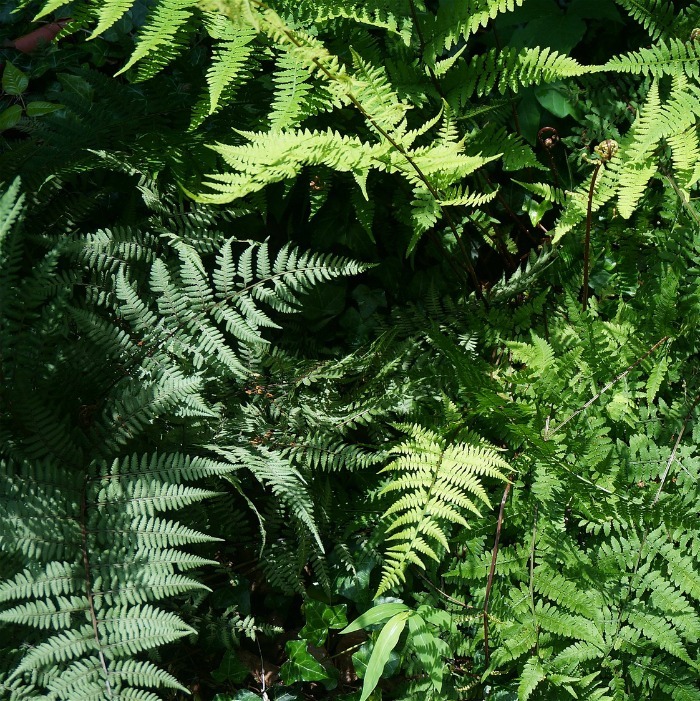 I found your advice on companion plants for Astilbe helpful and enjoyed your article/photos. Hi Carol I have always loved the Astilbes but haven’t planted any. You article has inspired me! I have Lenten Roses, my question, would I plant the Astilbes behind or in front of the Lenten Roses. Thank you for your friendship garden sharing. Nothing better than a friendship garden. I have a shady bed with hostess in it, along with hydranrias and an azalea. My astilbe are in another shady bed with my Lenten rose that looms all the time. But I will put some astilbe in with my Hosta bed. And also try some of your other flowers.